George Alfred Calcraft was the son of George Calcraft an ironstone labourer and his wife Elizabeth Calcraft. George Calcraft was born in Muston (1856) and Elizabeth Calcraft was born in Bottesford (1866). In 1881, just before Alfred was born, the Calcrafts were living at Loscoe Wharf Barley Grove and George was working as a signalman. George Alfred Calcraft was born 26 March 1882 at Eastwood, Nottingham (Birth IndexQ2 (Ap/May/Jun) 1882). His birth was registered at Basford. By 1891, the Calcrafts had returned to Bottesford to live at 4 Spalton Row. This is the terrace located on the northern side of Grantham Road, comprising four small cottages and a larger adjoining cottage closest to the road. Its name changed to Wyggeston Terrace, which it has today. They now had 3 sons and 1 daughter – George Alfred, James G, Charles W and Sarah H. The two older boys were at school. In 1901 the Calcrafts were still living on Spalton Row, Bottesford. Charles William and Sarah were at school and their father was working as a labourer in limestone. Alfred is not recorded as residing at the family address in the 1901 census. Neither does he show up in any a census search for 1901. 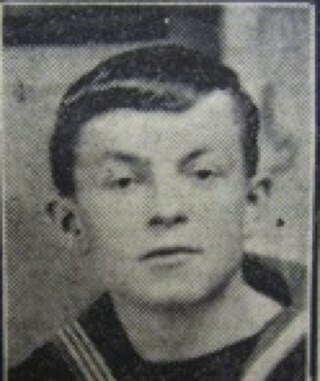 However by that time he was in the Royal Navy. At the time of his death in 1915 he had served for 16 years. In due course, all three boys would join the armed forces, and Sarah would serve as a V.A.D. nurse during the war. James joined the Royal Marines until demobilized after the war. Charles was the last to enlist, joining the Leicestershire Regiment but serving for most of the war in the Royal Engineers. In April 1911 George Alfred was serving as an Able Bodied Seaman residing at the Royal Sailor’s Rest, 172 – 174, Commercial Road, Portsmouth, Hants. He served on board HMS Latona. In 1912/13 he was with HMS Bonaventure as a gun layer and Captain of a champion six pounder gun-crew. They scored 6 rounds 6 bull eyes in 17 seconds and he was awarded a silver medal. 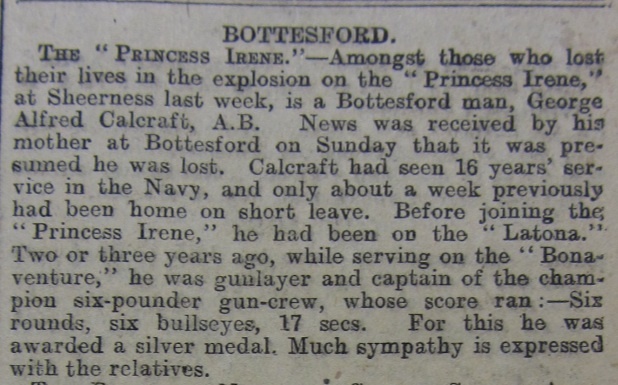 He died whilst serving on HMS “Princess Irene” (Service Number was 207458) when it exploded with the loss of all but one survivor from 225 crew members. 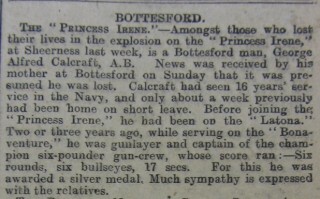 Alfred was aged 33 when the incident occurred at Sheerness, Kenton on 27th May 1915 . Sadly his body was never recovered for burial and he has no known grave. 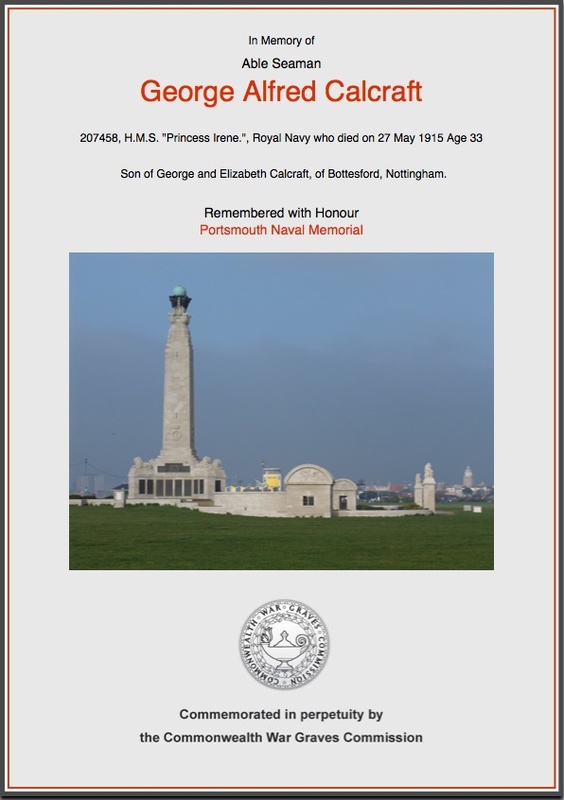 His name is inscribed on the Portsmouth Naval Memorial at Portsmouth and a description of the fatal incident and the names of his parents are entered in the Memorial Register. The steamship Princess Irene was built to the order of the Canadian Pacific Railway Company for their luxurious “Triangle Route” linking Vancouver, Victoria and the American city of Seattle. The ship was completed at Dumbarton, Scotland, in 1914 but, before she was able to leave for the Pacific, was requisitioned by the Royal Navy and converted into a Minelayer. She was 5,900 tons, 395’x54’x28′ launched 20 October 1914. Based at Sheerness in Kent, she was in the River Medway on 27th May 1915 when she blew up as a result of a catastrophic internal explosion. There was only one survivor. At about 11.14 on the morning of 27th May 1915, Sheerness witnessed the destruction of the minelayer HMS Princess Irene which was on No.28 buoy about 3 miles WSW from the town centre. The ship had been built in Scotland in the previous year to the order of the Canadian Pacific Railway Company but was requisitioned and converted for Naval use before she could sail to the Pacific. The Princess Irene had a complement of 225 officers and men, three of whom were ashore that morning as the mines were being primed on the ship’s two mine decks. Also on board were a party of 80 or so Petty Officers from Chatham in addition to 76 Sheerness Dockyard workers who were completing tasks prior to the ship’s planned departure to lay her mines on 29th May. The cause of the disaster was thought to have been due to a faulty primer although evidence at the Official Enquiry showed that the work of priming the lethal mines was being carried out a) in a hurry and b) by untrained personnel. The lower decks and keel of the Princess Irene remain more or less intact and have caused a degree of navigational problems to the large ships now using the eastern end of nearby Thamesport. At present there are no plans to raise her remains. At the time of Alfred’s death his mother, Mrs Elizabeth Calcraft, was living at 4 Wyggeston Terrace formerly called Spalton’s Row, Bottesford.